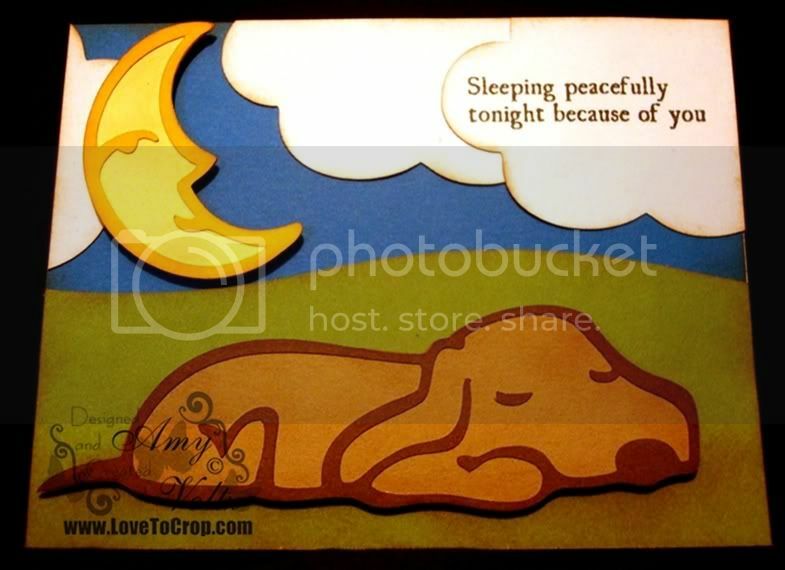 I used the Paper Pups Cricut Cartridge for the sleeping puppy (cut at 1.5") and the moon (cut at 2.5"). The clouds are from the Create A Critter Cricut Cartridge (cut at 3"). I used my Creative Memories Wavy Trimmer to cut the apple green cardstock. All distressing/shadowing was done with caramel ink. Both the puppy and the moon are popped up for dimension. I had a lot of fun creating this card... 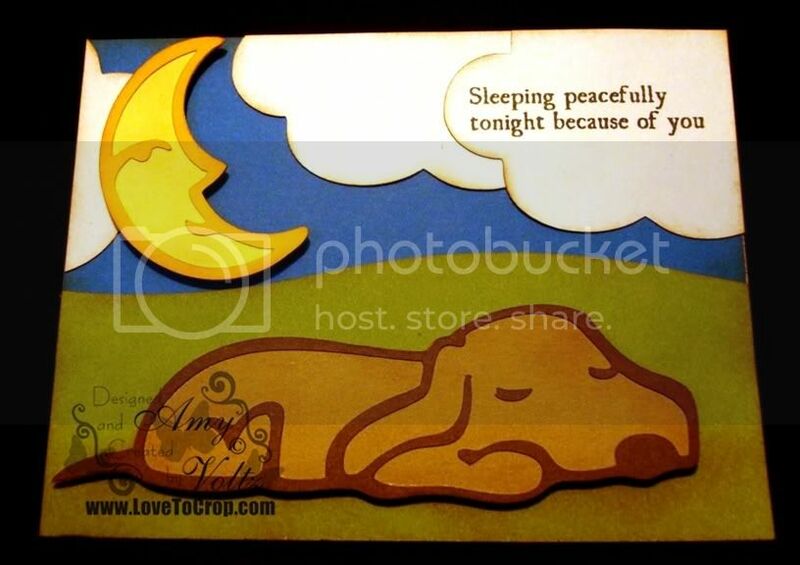 I knew I wanted to use this fabulous phrase from Kristal's set: "Sleeping peacefully tonight because of you" but I wanted it to be a 'happy' card... Well, it just so happens that while I was playing with my stamps on the evening that I received my sample, The-Toby-Dog was in his familiar spot (sprawled across my feet taking a 'nap')!! Who sleeps more peacefully amid the noisy distractions of everyday life than The-Toby-Dog??? I've seen him 'nap' with his eyes wide open!! He's such a funny dog... We adopted him from Animal Friends when he was only 10 weeks old (he was tiny and oh-so-cute!)... He's now morphed into a 50-pound 'puppy' who follows me everywhere and loves attention... And he's the best dog EVER!! If you offer him a treat, he'll bark "I love you" in his own special language... If you toss his bo-bo toy across the room, you'd better be prepared to play fetch for at least 20 minutes... And when you tell him to lay down, he'll almost always promptly go to sleep!! So the puppy on my card was inspired by my real life puppy and hopefully will bring a smile to the face of a special Hero who needs to receive this card!! OMG Amy! This is SO cute! I love paper pups and the sentiment goes perfect! Adorable card! :) Love that puppy. This is adorable!! What a clever idea to use Paperpups! I love that sleeping put and the moon, too cute! That is a fun cartridge. God Bless all our men and women protecting our country!! Great sentiment! I love how you chose to use it and that it has a special meaning to you. Hello to your "puppy"! I've wanted to kick myself 100 times over for not getting Paper Pups. This just makes it 101! btw Have you voted on Jillian's blog hop? There are some amazingly talent folks showing their work. How adorable! I love how you made an atypical military card. I am sure any military person would love to receive this. The dimension of the puppy and moon are great too. BTW, thanks for stopping by my blog. I appreciate the sweet comment you left. Awe your a sweetie:-) your puppy is darling ! Love your card! 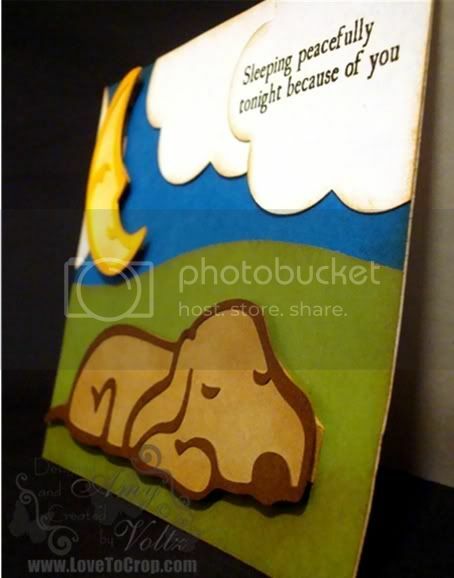 I'd love to have you stop into my blog for the I made it my self party :-) yesterdays card still touches my heart everytime I see it. I haven't used paper pups in such a long time~cute card! I may have to dig it out:) TFS! Well I'm not sleeping peacefully tonight because my cat got out, and i can't go to bed till he comes home. WAH! heeehee--I think you are insanely creative and I'm just THRILLED with your card! Love the card, such a cute sentiment. Thanks for sharing the great stories. This is absolutely adorable and so original! Great job. I just love it! Thanks for the extra chance to win! Love your card. It has a Doggie on it. I am so glad you are sending this kind of Sentiment to our Troops...that's why Kristal created them, so they will feel appreciated not as sad. I think what Kristal and her hubby did was genius. Thanks for the advice on the cats. I had chills when reading it, my dh did that tonight and two of them sat by him and he petted them. You are right timing...thanks so much for your thoughts. That card is so cute. I love that sentiment; how touching. Have to pull out my PP cart again!! The puppy is just too cute! Great tribute card for the troops! I love that Kristal is giving part of her proceeds to charity. That is so awesome! Awww....such a cute puppy and fitting for the sentiment. Is the moon sleeping, too? Have to tell you, I have been a follower of yours for a while, and you are one of the reasons I ordered this set tonight!!! Thank you! You definately hit my two loves...dogs and soldiers! What a great way to say thanks to our Heroes through OWH! I can't say enough good about this totally fabulous organization! Maybe the next military set that K Andrew does will benefit OWH! I'm sure that our Heroes will benefit more than we can imagine seeing cards made with these wonderful stamps! Great card. You are incrediable and very talented. Aw! That pup goes perfect with this sentiment! Cute card! I really like this stamp set! This card is soooo adorable...TFS!